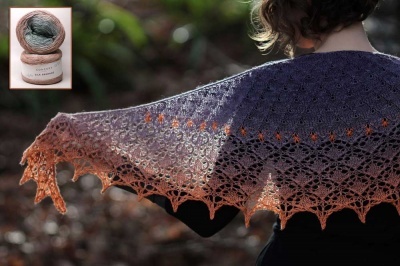 A delightfully simple wrap, that has such a unique look to it -- we think this one is marvelous. 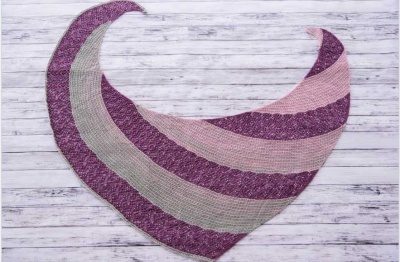 Created by Susan Pandorf of Sunflower Designs, this wrap originally was made of two skeins of Handmaiden Maidenhair though other yarns would look wonderful as well. Figure on about 500 m/ 545 yards total of a dk/light worsted yarn. 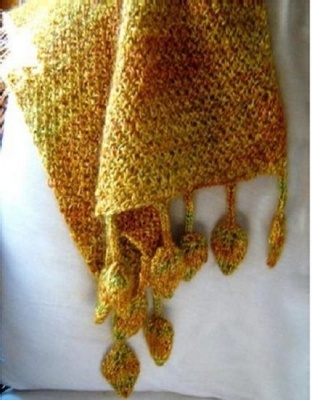 The wrap itself is a simple knit, using size 10 1/2 (US) needles. The finished size is about 16" x 60" . But the best part of this (in my oh-so-humble opinion) is the Leaf Fringe at the edges. Wow and wow again -- great fun to knit and beautiful to wear. And, EarthFaire being EarthFaire, may we suggest adding a few well-placed beads as part of these leaves as well? I could see some small ones sewn on to form leaf veins, or maybe some larger ones (6/0s or the like) pre-threaded to be judiciously placed and look like morning dew dripping off these beauties.